January | 2012 | Lipogram! Scorecard! I recently had a great assignment–read a bunch of sonnets! This I did, having previously gotten through a discussion of Robert Frost’s syntactically fiendish “The Silken Tent”–it’s one sonnet, where all fourteen lines are just one grammatical sentence. This is not the only one of its type, although most sonnets break it up a little bit. 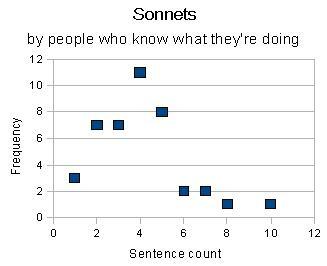 So I made a graph of how many sentences they had. Four sentences is the mode and median, and the mean is 3.95. This makes sense in the case of a Shakespearean sonnet, say (three quatrains and a final couplet), if each of those sections spaced out on the page happened to be an independent sentence. In this sample of 42 different poems, only one hit double-digits in sentence count (“Delirium in Vera Cruz,” by Malcolm Lowry.) I’m defining “sentence” as “thing ended by a period, question mark, or exclamation point, so something like “Oh!” (Wordsworth’s “London, 1802” counts). On the other hand…you have me trying to write sonnets. I glanced through 94 of my sonnets, written over parts of nine years, from five different sets; my Lipogram! Scorecard! output (2009-present), a bunch of lipograms on different letters (2004), some vaguely-related ones that it’d be a long story to explain (2005-2007, and one from 2011), Humbug Journal poems and comments (2004-2009), and some ones I wrote about Chicago (2011). The results are, um…a little different. Er, so, nine of my 24 Lipogram! Scorecard! sonnets are 11 sentences (and/or fragments!) long. Four are longer than that. I’ve gotten down to two twice, in 2004, and one of those poems was written two days after the other. (One was about baseball. The other was about a spelling bee.) At the upper limit, I got to twenty in 2004 (it was a dialogue thing so it was just two people going back and forth at each other; “Really? Do you think?” counts for two sentences and is only half of a line). The mean, overall, is 8.67, and the median is 9, with modes at 8 and 11. Three of the nine Chicago poems fit four sentences into the closing couplet. That flops amid wet glass and gasps in air? On reflection, that would not be my wish. I think that the comparison’s unfair. But water blurs you till you’re beyond use. But in a puddle, you lie soaked and loose. Can once in a while be justified. The shards and puddle leave me stupefied. Oh newspaper that was already free? New poetic form, as befits the way I heard about this story; every line is exactly 140 characters long. An American football field is one hundred yards long when measured (as most people would measure it) between the near edges of the endzones. Though the director does not speak to us, we take our places, finding our coordinates in tiny text placed in a folder (of the variety flip). A trending Tweet can be at most one hundred forty characters long, though that is enough for a quote whose context can be inferred, or quip. If one cannot infer context, of course, it is unclear whether the quoted person is referring to a physical location or a metaphorical place. But one could find out the story behind the uncelebratory stance, a deflection to credit the wind pushing things in three dimensional space. So a tie is broken. But sidebar trends tend to lag, and by the time the news breaks somewhere else the tie is restored and a footnote loses. Playing on another remembered field, the pale numbers beneath unseen, the gold halftime score above unremarkable, the marching band refuses. That floats atop a vast, enormous sea? There are no penguins here, nor could there be. Our eyes. We but glimpse one great piece of ice. But below you’s another hue and shape. I learned your different names. Do they suffice? Or gentle rain to nourish growing crops? To classify the hidden forms of tops. If they could have looked at clouds from both sides? New year, new idea for poems. I can imagine there being a lot where this came from, but no promises. Shall I compare you to a coiled snake? Or perhaps to twin snakes, that both lie tangled? No, I shall not; serpents seem no mistake. They’re keen and powerful, not frayed or mangled. That lies in wait to catch the hopeless mice? They say, but you are regressive, not nice. With such aid by my side, I proudly stood. Scorn you at risk to me. You’re still no good. If I do not care about my shoelaces?